Two eleven-year-old girls from the Australian bush, who were sent to live with Pixie's grandmother, in the 1920s, to attend the same private high-school in the city. This was one of my FAVOURITE shows when I was about 7. Basically it's about two eleven year olds - Pixie and Molly - who loathe each other and can't wait to finish grade 6 so that they can go their separate ways and never see the other again. 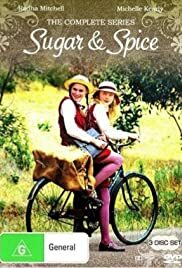 Living in a small country town, their entire school is in the one room and once they graduate, Pixie hopes to go to a private school in the city with her equally snobby friend, while Molly wants to quit altogether and work on the farm. However their parents have a different idea altogether, and Pixie and Molly are shipped off to live with Pixie's grandmother - together, in the same room, and attend the same high school. Of course the girls do eventually grow to like each other, but overall the show is a gorgeous portrayal of Australia in the 1920s and full of wonderful moments such as their first Valentino movie, first sighting of a plane, first trip in a motor-car, etc.